I'm looking for a software able to modify my voice as I speak. I'm mastering rpg via Mumble and it would be quite a useful bonus to the ambiance to make me sound like a robot, for instance. So far, I found MorphVox which answers perfectly my need. However, the free version is too limited and the pro version price is prohibitive. Create voices for online video games, avatars and podcasts. Voice disguiser for anonymity over the radio or internet. Change voices for voiceovers and other audio projects. Small download installs in seconds. Voxal works behind the scenes intercepting audio from your microphone before it goes to your applications, so you don't need to change any configurations or settings in other programs. Simply install and start creating voice distortions in minutes. 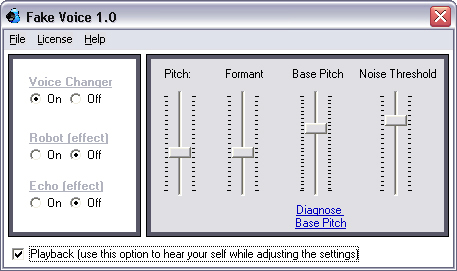 V Voice Changer Software DIAMOND is a program for changing your voice in real time. This tool includes various effects developing different tones of the voice, such as surprise, happiness, languor, rage, etc. This software enables you to record your voice, analyze the quality and compare it with other voices. Then you can add different effects to the recording, change female voice to, for example, male or nonhuman. You can also create a nickvoice, which represents a unique combination of voice properties with the help of a number of voice modifying functions - voice analyzer, parody mixer, voice comparator, music morpher, voice recorder, background effects. The majority of sound effects and unusual sounds are available for free download at the developer's homepage. I am no sound engineer but I guess these can work too if you have experience using the autotune. It will morph your voice in real time. It has a specific setting for sounding robotic. It is free of charge (gratis). The only requirement I'm not sure about is if can be used as an input source for Mumble, but I don't see any reason why not as long as your sound input for Mumble is located in close proximity to the output of Fake Voice. Not the answer you're looking for? Browse other questions tagged gratis audio voice-recording audio-editing or ask your own question.